Colin Lanceley, Night Garden 1997, lithograph. Where is the night garden? This is the story of a search for the origin of a work of art. The artist is known; the execution is admired; the motifs are mysterious, mixed and mitigate against a simple scenario. The journey begins..... Early in May 2014 I was successful in bidding online for an artwork offered by Lawson's of Sydney. 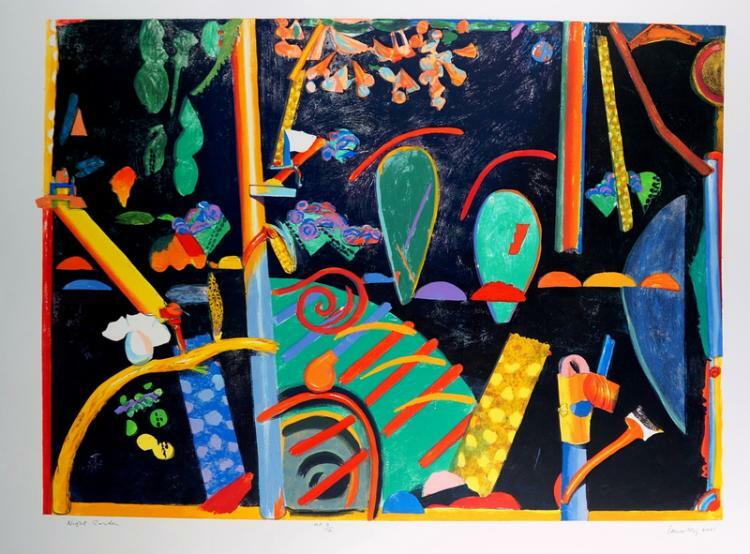 It was a 1997 framed lithograph entitled Night Garden, by Australian artist Colin Lanceley. Prior to this I knew precious little about Lanceley, apart from the fact that he had, at one stage, lived and worked in Wollongong's northern suburbs, just up the road. I had also recently been studying the work of Martin Sharp and Lanceley's name popped up in connection with the student newspaper The Arty Wild Oat put together by Sharp and Gary Shead during 1963. Also, during 2013, as a member of the Wollongong Art Gallery Reference Group, I had suggested to the Gallery that they acquire works from some of the major artists who had worked in the region since the 1970s, including Brett Whiteley, Lloyd Rees, Colin Lanceley and Shead. Unfortunately major works by these artists were now worth a hefty sum and largely beyond the budget of the Council-operated Gallery. Nevertheless, in 2013 Colin Lanceley was commissioned to do a work with a Wollongong theme. He had resided in the area at various periods since returning to Australia from Europe in the early 1980s and produced a variety of Illawarra-themed works. The commission was completed during the first part of 2014 and delivered to the Gallery in May. The View north from Port Kembla to the National Park was of coloured wood and artefacts in oil on canvas - a "relief painting" as some like to call such work by the artist. To my mind they were a combination of 2-dimensional painting with 3-dimensional sculpture. The Illawarra work portrayed elements of the local landscape, including the now destroyed Port Kembla stack, and was a valuable acquisition to the Gallery collection. It was also one of the Lanceley's final major works, for he died just 7 months later on 30 January 2015 at the age pf 77 and after a long illness. His 2014 commissioned work for the Wollongong Art Gallery was one of his last. Needless to say, I was thrilled by the success of the commission and the fact that this new work would supplement those items by the artist already held. I was aware of the significance of the acquisition as a result of preliminary research carried out during March - April 2014 into Lanceley's Illawarra work and presented in my blog entitled Colin Lanceley's South Coast. In the process of carrying out this research and seeking to identify additional Illawarra works and variants, I came across the Lawson's auction and the Night Garden print. As it was an interesting and attractive work available at a good price, I proceeded with the purchase. Three days later the print arrived in our house and questions immediately came to mind: Where was the night garden? What was the history of this work? Who carried out the printing? A quick trawl of the internet and scan of the major Lanceley published references did not reveal any detailed description of the work by the artist. There was a need to go deeper in order to answer these questions. A starting point would be any reference to Lanceley's many artworks featuring gardens. Colin Lanceley and his family left Australia in 1965 for an extended residence in England and Europe, before returning in 1981. A cursory study of his work since then revealed a number of themes, or subjects, and variations on those. 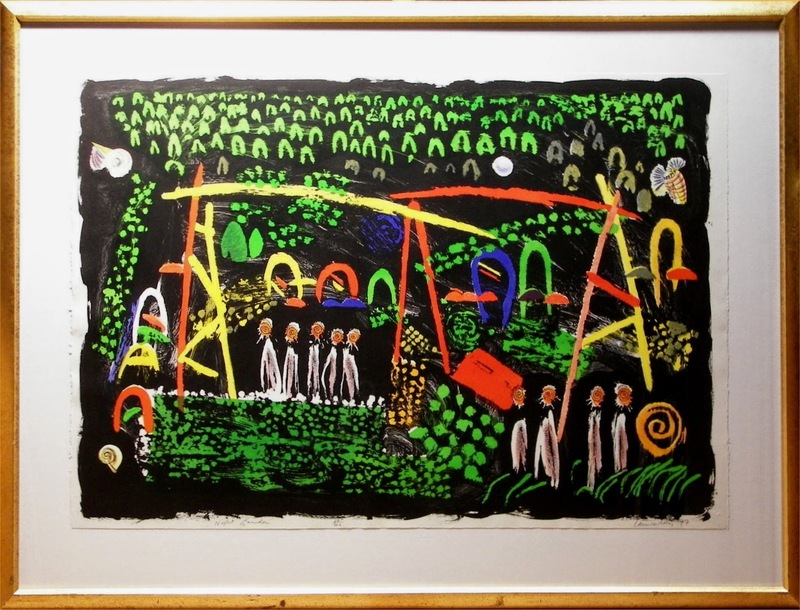 For example, since 1987 he had produced a number of large scale integrated sculptural and oil on canvas works featuring the northern Illawarra landscape. This was primarily the result of a holiday house at Wombarra used by the family. Lanceley had travelled through parts of New South Wales as part of the acclimatisation process following his many years overseas, and locations such as the Blue Mountains also featured in his art from the 1980s onwards. Another subject of interest was gardens, and specifically that of his friend Lynne Clarke, the daughter of artist Russell Drysdale. As noted in an interview with the artist by Janet Hawley, Lanceley regularly "enjoyed an evening meal in the lush garden" of Clarke (Hawley, 1993, 158). This became the subject of a major work in 1985, and subsequent variants in watercolour, gouache and print also appeared. The relief painting was an eclectic mix of motifs from the garden - beds, trees, trestles, bush and branches. Lanceley had fostered gardens whilst living overseas and Incorporated these into his work. A distinctive element of many of the garden works was Lanceley's use of black as a solid background depicting night. This was augmented by a darker suite of colours - blue, green, red - as opposed to the lighter ochres and bright colours so often used by him in his relief paintings and sculptures. As he told Hawley, "I love using the colour black. I love using it against other colours, because it makes them sing." This "singing", or heightening of colour through contrast, was to become a favoured technique of the artist. 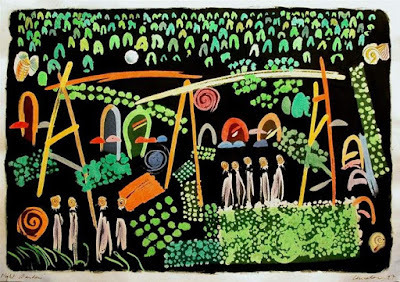 Lanceley also produced a woven wool tapestry version of Lynne's Garden in 1987, entitled Paradise Garden. A print labelled Nocturnal Garden produced in 1988 was a variant on the theme, and a version entitled Summer Night in pencil and ink is also known. During 1988 and 1992 he produced a series of works on paper which featured his south coast garden at Wombarra. These works did not have the black background of Lynne's Garden and its variants, but were very much light and airy works. A later variant on the night garden theme was Sounds and scents in the evening air from 1990, though this was distinguished by two large, semi-circular garden beds in yellow on the lower part of the work. 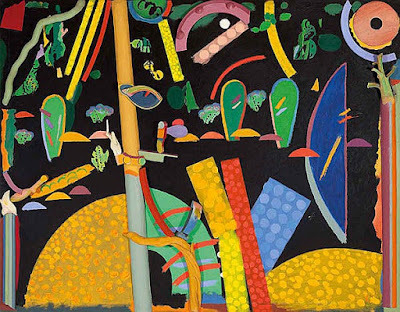 Colin Lanceley, Sounds and scents move in the evening air, painted wood and oil on canvas, 1990. 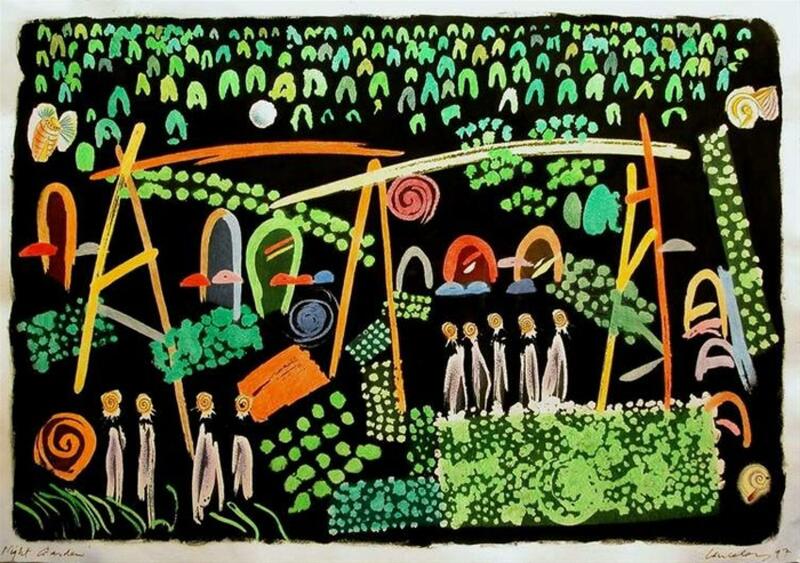 In 1997 Lanceley returned to the garden theme and produced a work in gouache and ink on paper entitled Night Garden. Colin Lanceley, Night Garden 1997, gouache and ink on paper, signed and dated l.r. titled l.l. 63.5 x 90.5 cm. Source: Charles Nodrum Gallery Works on Paper exhibition. It appeared to feature elements of the earlier Lynne's Garden works, though the same could be said of his south coast works, as there was crossover in many of Lanceley's work. The precise origin of the painting was unclear and no contemporary description of it by the artist was initially identified. A number of elements suggested that it was, in part at least, his Wombarra garden. These included the upper forested section which tended to represent the heavily wooded Illawarra escarpment. The linear elements along the right margin initially appeared to this author to represent the coastline, though they were obviously rectangular garden beds, or allotments, as they are also seen in the lower right section of the original drawing in gouache. During 1997 this work on paper was used as the basis for a lithographic print. A limited edition of 40 were taken from stone and printed in multiple colours on archival art paper from France. Each of the 40 prints was inscribed in pencil by the artist, with 'Night Garden' and 'Colin Lanceley 97' along the bottom margin of the sheet. 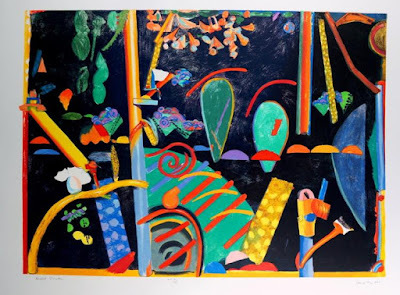 Colin Lanceley, Night Garden 1997, lithograph on paper, signed and dated l.r. titled l.l. 64 x 90 cm. The printed version was a mirror image of the original work on paper due to the reflective lithographic process and the fact that it was not copied onto the stone in reverse. For example, the garden allotments were now seen on the left and lower left hand sides of the print. The inks used in the print were darker than the gouache and contrasted strongly with the black background. The copy of the print obtained by the author through auction had been placed in a gold frame behind perspex by a Victorian framer, indicating the likely location of its original sale. Beyond this, the work itself did not provide an answer to the precise origin of the imagery contained therein. The mystery remained. Another variant on the garden theme appeared in 2001 in the form of a limited edition of 80 callograph prints titled Night Garden and hand signed by the artist. 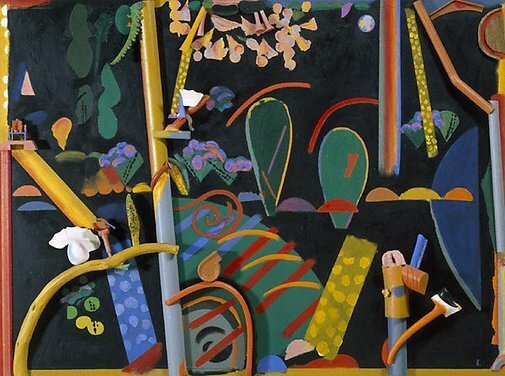 The content was different to the 1997 Night Garden lithograph and was basically a copy of the Lynne's Garden work on canvas from 1985. Colin Lanceley, Night Garden, 2001, callograph print, 66 x 86cm. It is not really a specific garden. It is more a composite of various gardens I have had. Whenever we had a property I liked to have a vegetable patch, with allotments. I have had numerous gardens, in Australia and overseas. So it includes my south coast garden and others. The trestles are part of that. With the Night Garden I liked the idea of the black background, as it highlights the colours and creates a jewel effect. Just like how jewellers place diamonds on black velvet to highlight the gem and bring out the sparkle. The black sets off the colours. (Colin Lanceley, pers. comm., 26 May 2014).